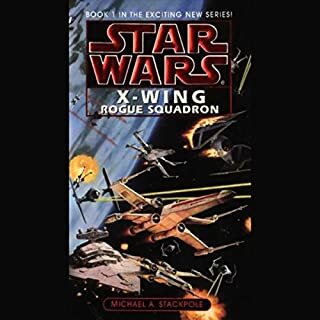 New York Times best-selling author Michael A. Stackpole presents a stirring new tale set in the Star Wars universe: the dramatic story of a heroic X-wing pilot on the razor's edge between the Force and the dark side. Corran Horn has distinguished himself as one of the best and brightest of Rogue Squadron's elite fighting force. 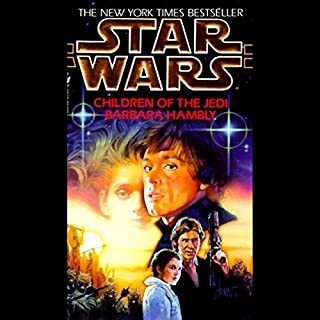 Then his wife, Mirax, vanishes on a covert mission for the New Republic, and Corran vows to find her. To do so, he knows he must develop the latent Force powers inherited from his grandfather, a legendary Jedi hero. 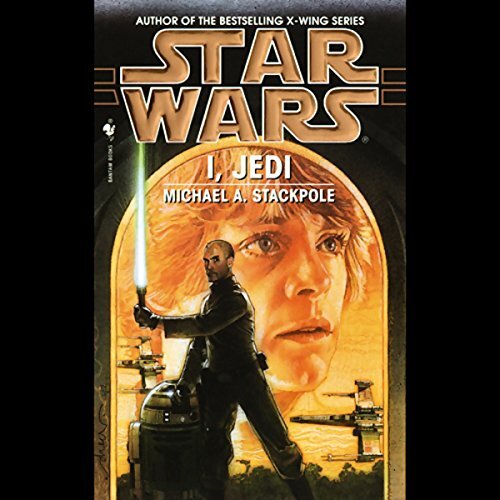 He joins Luke Skywalker's famed Jedi academy to begin training, only to quit in frustration at Skywalker's methods. Now Corran is on his own. Using his Corellian undercover experience, he must infiltrate, sabotage, and destroy a ruthless organization in order to find his wife. But to succeed, Corran will have to come to terms with his Jedi heritage and make a terrible choice: surrender to the dark side...or die. (P)2008 Lucasfilm Ltd. and TM. Taken on its own merits, this audiobook is ok. It tells the story of I, Jedi and covers all the major elements and plot points. Anyone who has not read the novel will enjoy this. Anyone who has read the novel will hate it. this is an ABRIDGED version of I, Jedi. nearly 600 pages reduced down to just under 3 hours of audio. An unabridged audiobook of that length should take 12-13 hours to run through, and as such the editing takes its toll. almost all the supplementary descriptions and non plot critical conversations that serve to immerse the reader have been removed or altered, leaving the final product feeling hollow and lacking depth. I honestly think that I MAY have enjoyed this book more if it was not abridged. I bought the abridged version because there was not an unabridged available. The scenes came... one right after the other in quick succession, not allowing the fullness of the story to be absorbed. I really wanted to like it... but couldn't find the rhythm. I have heard Anthony Heald before in a business book, one of Chet Holmes' I think. In that genre he does well. In the Star Wars EU I don't think I will listen to any more if his performances, at least not until I have exhausted all other means. His personas were narrow and unconvincing and his narration was generally uninspiring. And how about those pronunciations?? Maybe I am just used to Marc Thompon (Whom I really enjoyed in the Thrawn Trilogy), but pronouncing the middle C in "Coruscant" and "Exar Kun" as Exar Kyioon... not my favorite. Although I enjoy the Star Wars Storyline, I was not convinced by the Exar Kun character. After 4,000 years of dormance, why come back now? Why not during the emperor's reign, especially if you claim to be so much more vastly powerful than him? I dunno, left something to be desired. 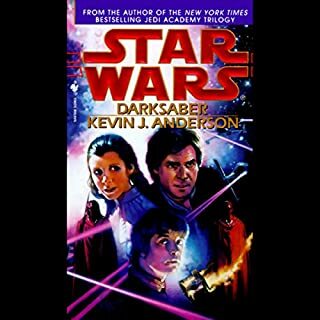 I own this book, and this audio version doesn't include everything. You'll only hear the main parts of the story with much left out. Please do not waste your credit on this. This story jumps around a bit and to sort Hopefully the unabridged version of the book is better. Would you try another book from Michael A. Stackpole and/or Anthony Heald? I love both the author and the performer. I grew up with their books and their narration, respectively. I've read the book probably 15 times. I'd buy another one of these in a heartbeat. However, whoever edited the book for abridging made some really terrible calls, in my opinion. They cut out a lot of the fantastic characterization that Stackpole is known for in favor of fight scenes, which lack significance without really understanding the motivation. Leaving the whole Gantoris subplot really diminished the threat of Exar Kun; removing most of the character scenes from the Survivor subplot had very similar effects. When Corran finally faces Remart, it's hard to care. Loved Reading it, hated hearing it. 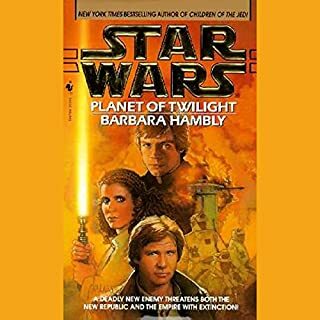 This was my favorite Star War EU book... until I listened to this performance. The voice actor makes the main character sound like an aristocrat, not Tough as nails detective. 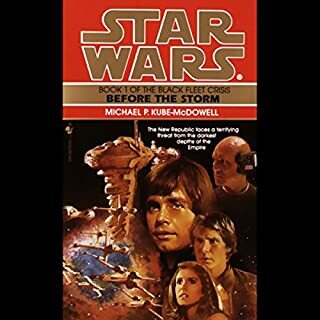 The sound effects and music take away from the experience, and the abridged version took a day of listening when the book used to take me a week of reading to finish. The whole thing felt hurried an disjointed. 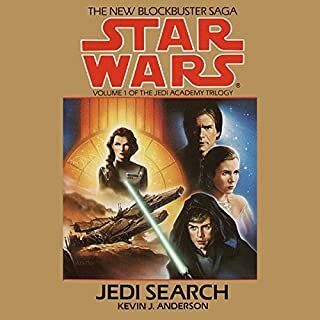 That's the last Star Wars book I invest in on Audible. i love this book. hated the abridged audio version. read the book, 10x better. so many elements that made this story great, like character development, do not exist in the abridged version. This cuts out a lot of the book. Not what I expected. Narration was soft and at times hard to follow. What was most disappointing about Michael A. Stackpole’s story? Sooo disappointing, the story is cut far too much to make sense. The narrators voice is terrible and the use of sound effects should be good but they drown out the words.